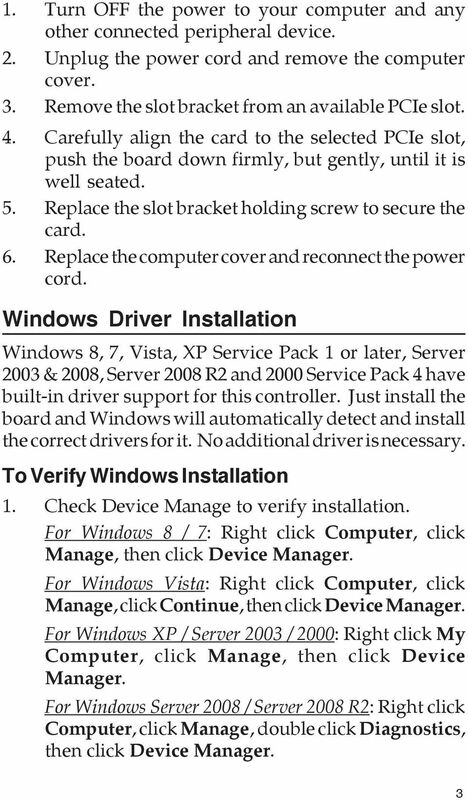 Download "DP Hi-Speed USB 4-Port PCIe Quick Installation Guide"
8 About SIIG, Inc. 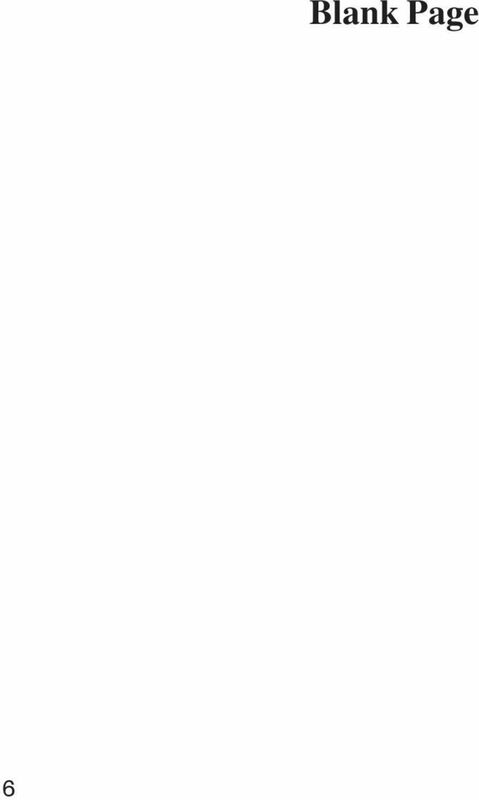 Founded in 1985, SIIG, Inc. is a leading manufacturer of IT connectivity solutions (including Serial ATA and Ultra ATA Controllers, FireWire, USB, and legacy I/O adapters) that bridge the connection between Desktop/ Notebook systems and external peripherals. SIIG continues to grow by adding A/V and Digital Signage connectivity solutions to our extensive portfolio. All centered around the distribution and switching of A/V signals over CAT5/6, these products include matrix switches, distribution amplifiers, extenders, converters, splitters, cabling, and more. 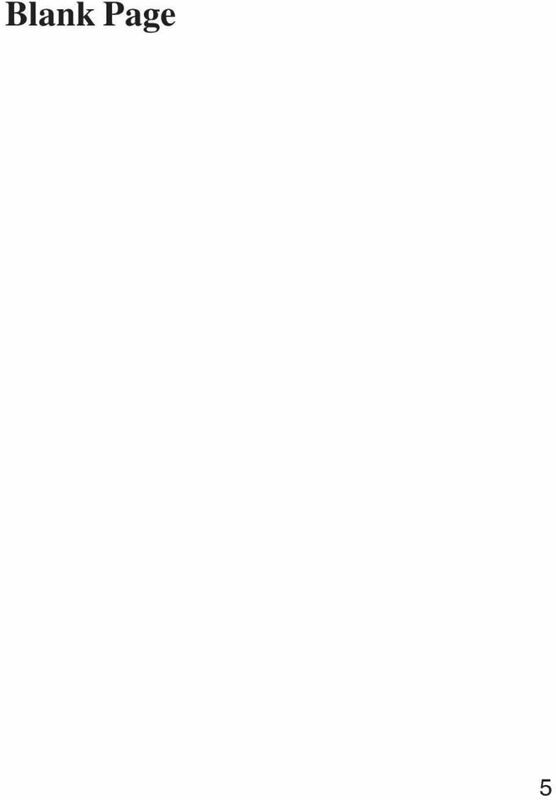 SIIG is the premier one-stop source of upgrades and is committed to providing high quality products while keeping economical and competitive prices. High-quality control standards are evident by one of the lowest defective return rates in the industry. Our products offer comprehensive user manuals, user-friendly features, and most products are backed by a lifetime warranty. 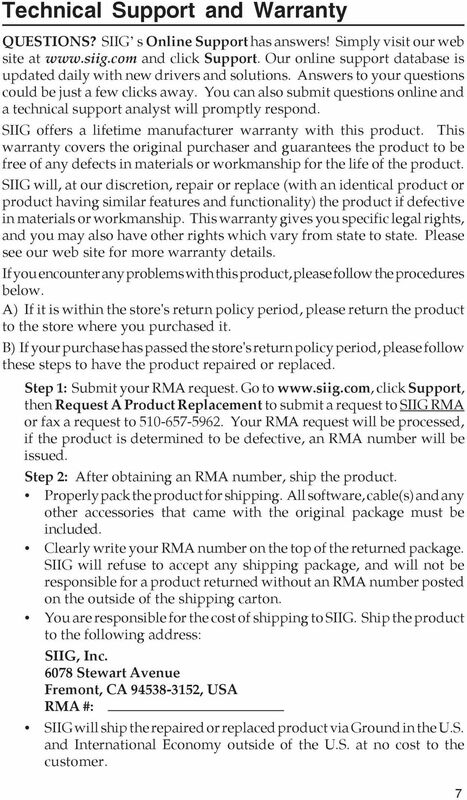 SIIG products can be found in many computer retail stores, mail order catalogs, and e-commerce sites in the Americas, as well as through major distributors, system integrators, and VARs. PRODUCT NAME DP Hi-Speed USB 4-Port PCIe FCC RULES: TESTED TO COMPLY WITH FCC PART 15, CLASS B OPERATING ENVIRONMENT: FOR HOME OR OFFICE USE FCC COMPLIANCE STATEMENT: This device complies with part 15 of the FCC Rules. Operation is subject to the following two conditions: (1) This device may not cause harmful interference, and (2) this device must accept any interference received, including interference that may cause undesired operation. 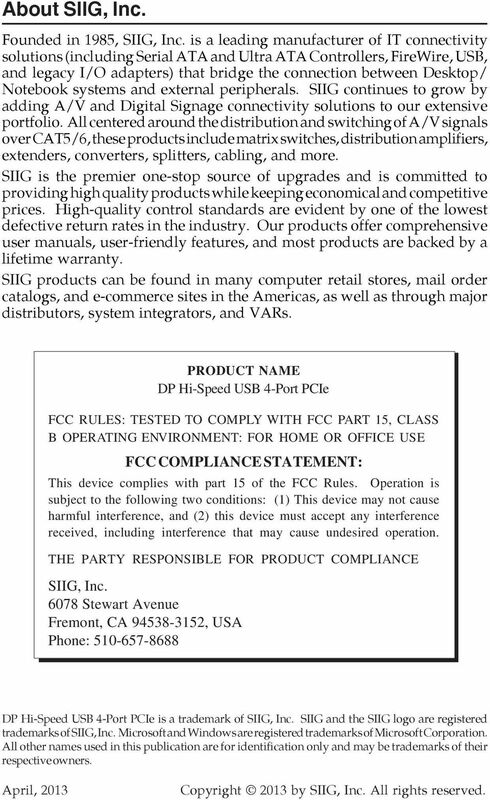 THE PARTY RESPONSIBLE FOR PRODUCT COMPLIANCE SIIG, Inc Stewart Avenue Fremont, CA , USA Phone: DP Hi-Speed USB 4-Port PCIe is a trademark of SIIG, Inc. SIIG and the SIIG logo are registered trademarks of SIIG, Inc. Microsoft and Windows are registered trademarks of Microsoft Corporation. All other names used in this publication are for identification only and may be trademarks of their respective owners. April, 2013 Copyright 2013 by SIIG, Inc. All rights reserved. USB 3.0 9-Port Aluminum Hub & 2.1A Charging Port Installation Guide Introduction The USB 3.0 9-Port Aluminum Hub & 2.1A Charging Port adds nine USB 3.0 ports and one 5V/2A USB charging port to your system. FireWire 800 + Hi-Speed USB Combo Quick Installation Guide Introducing the FireWire 800 + Hi-Speed USB Combo The FireWire 800+Hi-Speed USB Combo features the latest technology in FireWire 800 and USB 2.0. 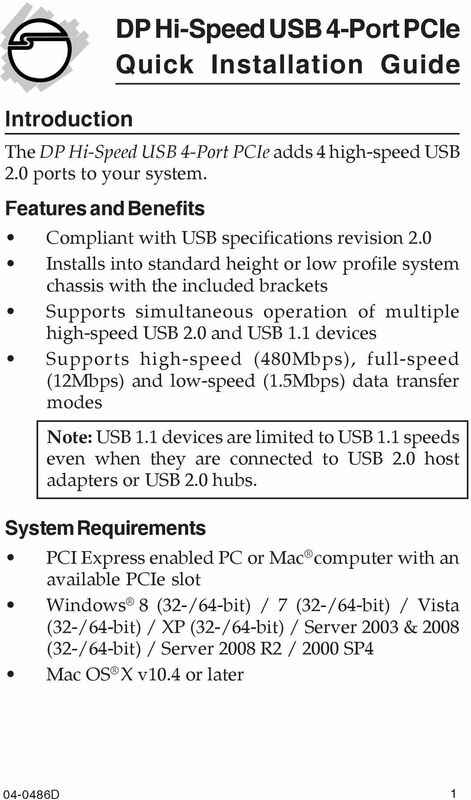 USB 2.0 Gigabit Ethernet Quick Installation Guide Introducing the USB 2.0 Gigabit Ethernet The USB 2.0 Gigabit Ethernet adds 10/100/1000 Mbps Ethernet port to your USB enabled (USB 2.0 or later) system. Micro HDMI to VGA with Audio Adapter. 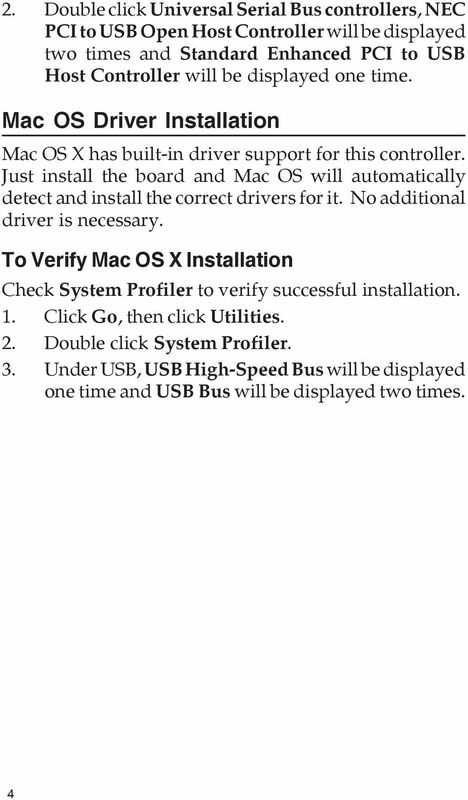 Quick Installation Guide. Introduction. Key Features and Benefits. 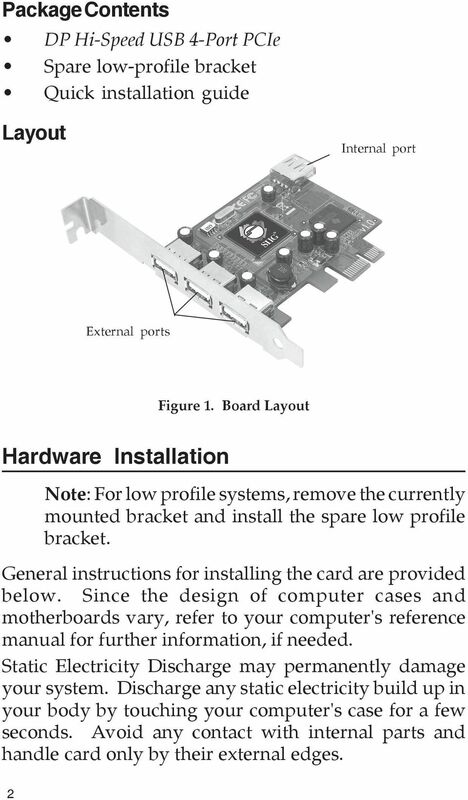 System Requirements. The UltraATA 133 PCI is an ultra high-speed dual channel Ultra ATA/133 controller board for use in Pentium-class computer. The SATA II PCIe RAID is an ultra high-speed two channel Serial ATA Generation II RAID controller for use in PCI Express enabled systems.